Have you experienced aches or tightness in your joints as a result of periods of inactivity or excessive use? These may be osteoarthritis symptoms, the most prevalent type of arthritis. So, exactly what is going on inside your body? The breaking down of cartilage material results in friction of the bones, producing stiffness, pain and a reduction of mobility in the joint. Osteoarthritis normally has an effect on the hips, hands, knees, lower back and neck. If you think that osteoarthritis could be impacting your life, Visiting Angels recommends getting a complete physical exam by a doctor – and we’re available to provide San Jose CA elderly care assistance. The following information can help you understand the symptoms of osteoarthritis (OA), as well as tactics to help effectively manage the condition. Stiffness or pain in joints after periods of inactivity or excessive use. Grating or “catching” experience during joint movement. Bony growths at the margins of impacted joints. 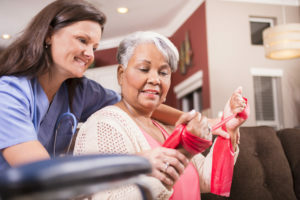 Therapeutic solutions often consist of a blend of drugs, rest, physical activity, joint protection, use of heat or cold to reduce pain, and occupational or physical therapy. Many individuals with OA utilize pain medications like acetaminophen or nonsteroidal anti-inflammatory drugs (NSAIDs) to assist in reducing joint pain, stiffness and swelling. Remaining physically active keeps joints limber and preserves or enhances muscle strength. Maintaining a healthy weight is important for prevention of and to slow the progression of OA impacting the weight-bearing joints (knees and hips) and lower back. Corticosteroids or hyaluronic acid derivatives can sometimes be injected into joints that are unresponsive to treatment. Call Visiting Angels at 800-969-0499 to learn more about our Santa Clara County and Alameda County home care services!